“The Dead Sea Scrolls are undoubtedly the most important discovery found in Israel in the field of the Bible and history of Judaism and Christianity.”¹ Fragments of about 900 scrolls from the 2nd Temple period (some dating as early as 3rd century BC) were found in the Qumran caves (NW shore of Dead Sea), between 1947 and 1956. Every book of the Old Testament (except Esther) were represented in the finds, including one complete copy of Isaiah. I had opportunity along with my group to visit this important archaeological site last month and photograph the caves. 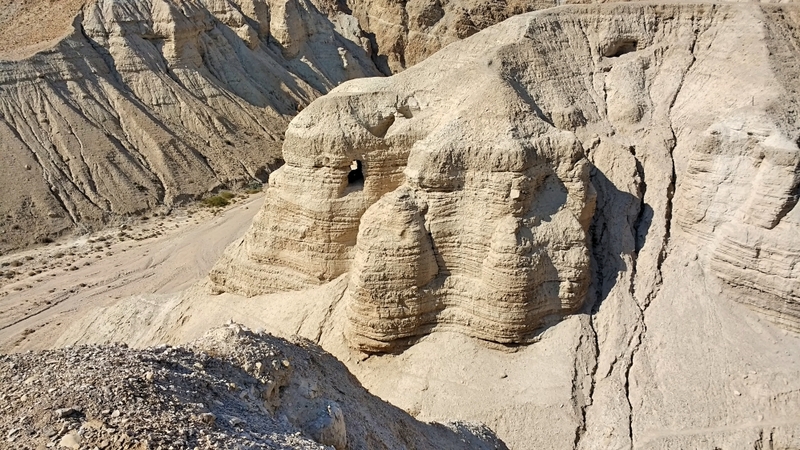 Qumran Caves, on western side of the Dead Sea. Photo by Leon Mauldin. Dr. Hodges pointed out that no new translations had to be made as a result of the discovery of the scrolls; they confirmed the accuracy of transmission of what we already have. (This post makes use of previous material I wrote for this blog last Dec. 2015). 3 Bible and Spade (1978), 7(1), pp.12–14. This entry was posted on Wednesday, December 21st, 2016 at 4:28 PM and is filed under Bible History and Geography, Bible Study, Evidences, Israel, Old Testament, photography, Travel. You can follow any responses to this entry through the RSS 2.0 feed. You can leave a response, or trackback from your own site.